No San Juan Islands Ferry Hassles! Start your San Juan Islands kayaking tour in style. 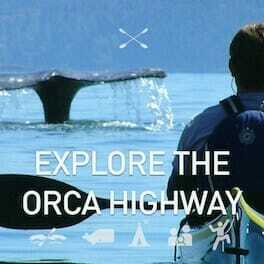 Washington State kayaking trips with Anacortes Kayak Tours are the ultimate experiences in 'soft adventure'. No kayaking experience is necessary and the San Juan Islands ferry hassles are not required. 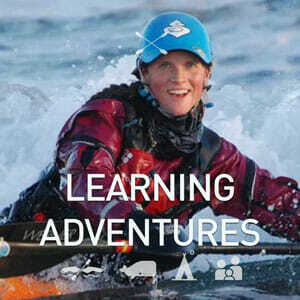 Join us for sea kayaking in the San Juan Islands! The San Juan Islands and surrounding areas boast some of the most productive wildlife viewing opportunities in Washington State. Our staff of professional sea kayaking guides know just how to maximize your chances of encounters with porpoise, seals, whales, and a host of intertidal sea creatures that are found in the San Juan Islands. Sea kayaking on the protected waters of the Puget Sound region is one of the most popular ways for visitors to experience the San Juan Islands and is an activity that should not be missed. Whether you are just visiting Washington State for a few days, or are fortunate enough to live near the San Juan Islands, you should not let this opportunity pass you by! We won't wait until you get to the San Juan Islands to pamper you – we start right now. Use our easy and convenient online booking system. 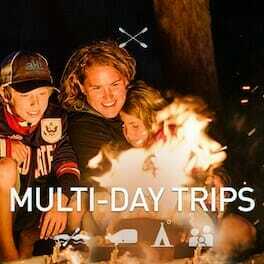 Select a kayaking trip below to start your San Juan Islands adventure. 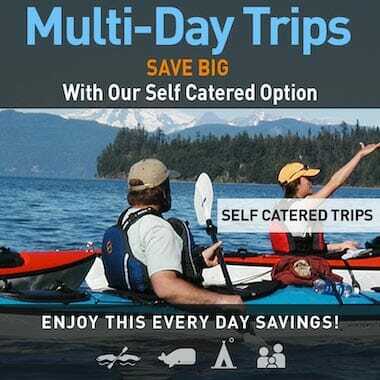 Many of our San Juan Islands kayaking trips, especially the day trips, fill up quickly so we recommend you reserve a spot. If you would like to discuss your San Juan Islands vacation plans or just prefer the human touch, give us a call at (360)588-1117 or toll free, (800)992-1801. We will be happy to assist you during our extended seasonal summer business hours, and every darned day of the week. Join us! 1.5 hour trips, 3 hour, and day trips kayaking the San Juan Islands coast. Perfect for everyone. Scout for wildlife or channel your wild inner nomad on our two, three, four, and five-day trips into the San Juan Islands. 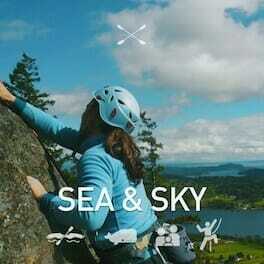 Explore coastal magic from a new perspective and mix it up for a unique day–kayak & climb. The best kayak lessons and instructional classes in the San Juan Islands can be found in Anacortes, Washington. CAN NOT COMBINE WITH OTHER OFFERS or SINGLE KAYAK. 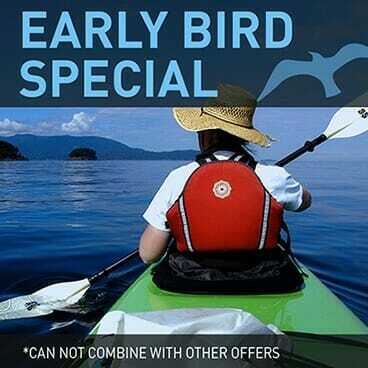 THIS MEANS THE DISCOUNT IS ONLY AVAILABLE FOR TANDEM KAYAKS AND NOT IN CONJUNCTION WITH ANY OTHER DISCOUNTS.